Nifty card! Would be awesome! I love totally target!!! thanks for the offer!!! Thanks for all the hard work that you do. This would be an awesome anniversary gift for us! Thanks for all that you do! My son’s birthday is in 2 weeks and this would make a great gift!! Happy St Patty’s Day! Today’s my lucky day! I “like” and totally love you on facebook! Thanks again for everything! Where do you find all these cool gift cards? Awesome! I would live to win! I love shopping at target for bargain deals. I am already a FB fan of yours. You posts are freat to follow on facebook! 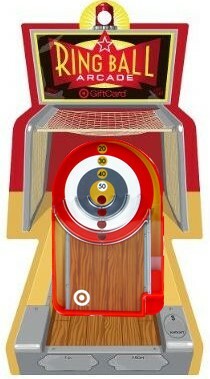 This card reminds me of Skee-Ball, my favorite arcade game! Very cute 🙂 I love your giveaways! What a fun gift card!!! Thanks! I would live to win! Already like you on FB and love your blog!! Thanks for helping us all save some green!!! I love your giveaways. The cards are great. OMG! I HAVE to have this!!!! I for sure follow you on FB!! Super cute gift card! Good luck all. Thanks totallytarget! Entry numero uno 🙂 Thx for the opportunity! I like Totally Target on Facebook , thanks. Love Totally Target on Facebook!! !